How many of you are in debt? How does it feel when I ask you this question? How does it make you feel when you are in debt? Check in and see what emotions come up for you. I would think there is a lot of guilt surrounding your debt. When we feel guilty about anything, we may feel overburdened. It is a universal law that guilt demands punishment. We vibrate guilt out to the universe and because guilt demands punishment, we attract punishment. It comes in the form of self-sabotage or we attract someone else coming into our lives to beat us up. One of the most important keys around creating wealth is to learn to feel innocent around money. What does this actually mean? For starters, remember that money is just a piece of paper. It is not who you are nor is it your self-worth. 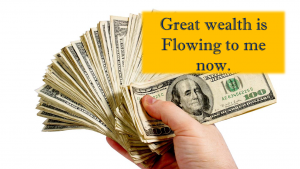 Oftentimes, when people think of money, they tend to put up some kind of resistance to it. Resistance stems from fear, separation and scarcity consciousness. As a result of feeling constricted, resistant or shut down, we are actually cutting ourselves off from our connection to our flow, the abundance of the universe to allow good things to come into our lives. Ask yourself this question, “Can I feel resistant and prosperous at the same time?” Well, of course not. “Can I feel afraid and expanded at the same time?” No. Resistance blocks your prosperity. Your foot is on the brake. What you resist, persists. One way I have found to let go of resistance is in the act of giving. Give as you go and create a flow. This turned out to be one of my most important secrets. As I explained in article 1, I was not in a good situation in my life when it came to money. Now, please hear me.… Despite the outward appearance of lack, I would give something, anything to others, even if it was only a dollar, because the more I gave, the more I received. It helped me to feel abundant and know that I added value, but what it really did was prime the pump. Giving joyfully allows us to vibrate the feeling that we are abundant. When we are walking around feeling abundant as opposed to feeling broke or not having enough, the vibration is totally different. So, in a nutshell? Give as much as you can and create your flow. I can see how this would be counter-intuitive for some people; “What do you mean, give as I go? I don’t have it to give.” I’m telling you it works. I did it. It works when you give without attachment to the outcome, but only give when it makes you feel good. Think about it – when you feel good, don’t things just seem to flow? Your why is having a reason greater than what your reality is right now. If you ask most people if they want to be rich or financially free, you will get a resounding yes! But, then reality sets in and the road seems too long with too many hills to climb. You have too many bills and it just becomes easier to work for money and hand over the excess to your broker or bill collector. This is where it is so important to have a greater reason than your current reality. Why are you doing it? Figure out the reason you want something greater than what you have now. You need to have a good why. Again, if you remember from article 1, my why was my 2 ½ year old son. Some other why’s include helping humanity or just feeling better. Find something juicy in your life that gives you a reason greater than the reality that you have right now. This will help you to continue even when things get challenging. It gives you the carrot in front of your face telling you, that’s why I’m working, or walking or just plain moving. You are then able to say to yourself that you are going to keep going, keep doing it and not give up. As Dori said in the movie Finding Nemo, “Keep on swimming, keep on swimming.” I always say, “don’t give up before the miracle”. Step 1: Ask for what you want. If you don’t know what you want, just take a look at everything you don’t want and it will give you a clue as to what you do want. Contrast leads to clarity. Write down all of the things you don’t want; you know what those are. This will take you directly to what you do want and that will bring clarity. You have to ask for what you want and be clear about it. What is it that you choose to have in your life? Step 2: The Universe responds to your asking. It’s that simple – Steps one and two are guaranteed. You can call it your Higher Power or whatever you wish, whether it is God, Universe, Great Spirit, Energy. Remember, there’s an ask and there’s a response, and the Universe always says yes. Now, I know what you are going to say: “I’ve done things like asking for and envisioning what I want, affirmations, treasure maps, vision boards and it doesn’t come to me”. These are all great things to do, but you have to be in the right vibration. If these tools aren’t working, there is still something blocking you from getting what you are asking for. This is what we have been talking about throughout this series – Your Bubbletalk. Remember, the Universe also responds to your Bubbletalk and it may be getting mixed messages. This also leads me into something called conscious language. Say you are affirming that you want a red Mercedes. The Universe will respond that yes, indeed, you do want a red Mercedes. You may want to choose to be more conscious with your language. This means you would say that you choose to have a red Mercedes or that you are creating and allowing a red Mercedes to come to you. This statement is very clear for the Universe to say yes. Can you see the distinction between saying that you want something and that you choose to create it or attract it? When you say you want something, the Universe is going to agree and say, “Yeah, I see you really want that, yup!” Know that we are always consciously or unconsciously asking for things with our words and thoughts. The Universe’s Law of Responding is always constant. This step is what gets most of us into trouble, but why? Well, because of our Bubbletalk; the unconscious belief systems that keep reminding us that we don’t deserve it, we’re not good enough or it’s better to give than to receive. It’s the receiving part that is the biggest thing. Trust and allow and don’t ask how. Receive it, it’s yours, it is your birthright! I know of people whose entire retirement strategy is winning the lottery. Well, that’s interesting to me. There are statistics that indicate that a good portion of lottery winners go broke. Any idea why? They are out of their comfort zone; their beliefs of not being worthy, not deserving or not feeling good enough along with the feeling of guilt, negate any long-term reality of abundance. What are you worth? Many of us tie our self-worth up with our bank account. You are also not your credit score. You are not your bank account. You are worthy no matter what you have in the bank. There is this entire belief system about wealth vs net worth. What you may or may not know is that your wealth is not measured by cash alone. Your net worth is actually your network. The more of a network you have, the more resources you have, the wealthier you are and the more you can leverage. You are not alone. It’s vital to start digging around in your unconscious so you can raise your belief systems to the conscious level and really be aware of them so you can do something about it. The bottom line on how to create wealth is this: Ask, and the Universe responds. Then you receive it. Always keep in the back of your mind, “Ask, and then trust and allow and don’t ask how”. Now you have the tools to focus on what you want, let go of the fear and allow yourself to live your lives in a way that is on course without invalidating yourself when you happen to go off course. That’s another key. Remember: it’s socially acceptable not to receive, however, in my world it is spiritually inappropriate. Giving and receiving is the same energy; it’s part of the whole; you are part of the whole and you can’t have one without the other. Flow out your abundance and vibrate what you choose and remember that what you focus on expands.